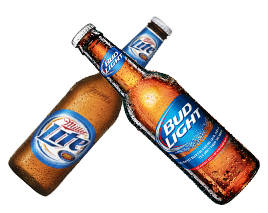 By now, you’ve probably read at least some sketchy reports about the Justice Department’s decision to look into the recent flurry of distributor acquisitions by AB/InBev, the Brazilian/Belgian conglom which now owns that “All American” beer family, Bud Lite and its two dozen Lessers. If you’re unsure about exactly what the issues are, this Washington Post piece, written by the uber-capable Diane Bartz, lays it out succinctly. Or, you may be following the recent Suds Opera which has AB/InBev acquiring their main rival, SABMiller, a deal which was consummated the very morning I write this. 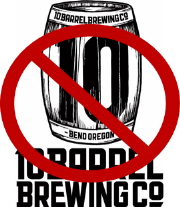 But for those too busy/lazy to work a mouse, what’s in question is AB’s latest gambit in their ongoing battle to lead all of us misguided children back from our extended fling with IPAs and Stouts and Sour/Brett ales and drag us back – for our own good, of course! – to those watery, insipid Adjunct Pilsners that, for 100+ years, were ALL anyone in the US meant when they said the word “beer“. From what’s leaked out of AB sales meetings and corporate conventions, AB has long been convinced that craft beer, currently growing by leaps and bounds even as Big Beer’s market shares decline like day-old sushi, was just a fad; a phenomenon akin to the Pet Rock or Bieber Fever or frat boys swallowing goldfish. Their attitude toward American craft brewing was, for well over a decade, “Aw, they’ll all get sick of those bitter beers and come a’runnin’ back to real beer!“, and didn’t really get serious about the idea of losing their catbird perch atop the world beer markets until about five years ago, when it was already too late and craft beer was so firmly entrenched that even checking its growth proved so impervious to the standard AB market tactics that it began to look more like Ebola than brewing, to the fat cats in Brazil. Because the bedrock principle at AB has always been to throw money at problems – because money was always the only advantage Anheuser Busch had over other breweries – they’ve fought back desperately against the rising tide of small, independent brewers on multiple fronts, as in their time-honored tradition of heaping scorn on anyone who dares to challenge their market supremacy, ala the infamous Super Bowl ad, in which they inadvertently poked a middle finger at their own newly-acquired brewery in Seattle with their smarmy ad ridiculing “Peach Pumpkin Ales”. 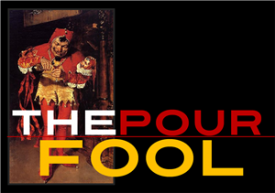 When that particular gaffe was exposed, they retreated into their usual hardball ploys, as in siccing packs of feral lawyers on South Carolina legislators to block the planned construction of a Stone Brewing satellite brewery there, trying to influence legislation in Florida which aimed to eliminate growler fills (since, of course, Bud Light is not something anybody wants in a growler) and restricting the direct sales of brewery products in favor of a three-tier distribution system that’s automatically stacked in favor of fat cat operations like AB. 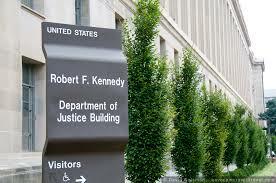 That little maneuver is what the US Justice Department regulators are now looking into in California. AB/InBev has been on a buying binge, over the past year, snapping up local and regional distributors in an effort to make it harder for craft brands to reach retailers. 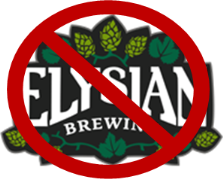 In Seattle, they gobbled up K&L Distributors several years ago, a major player in the Washington beer scene, and so acquired brilliant craft brands like Firestone Walker, Alaskan Brewing, Ninkasi, and Goose Island, which they later bought out altogether. Most of the brands which were caught in the distributor buy-outs eventually extricated themselves from any association with AB, as the company’s anti-craft bias becomes more obvious by the day. I received several links this morning via Facebook, from friends and brewers who supposed, with ample evidence, that I’d go ballistic about this Justice probe, because it’s always so entertaining to watch a grown man froth at the mouth. 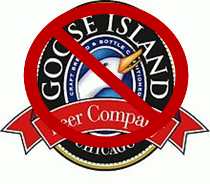 I’ve savaged AB many times, here, and have no plans to stop, mainly because – and I’d REALLY appreciate it if everybody who reads this blog understand this clearly – my real complaint with the old Anheuser Busch and the current AB/InBev is not about bad Pilsner or some free-floating grudge against “Big Beer” but about AB’s 100-year campaign to be the ONLY brewery in the United States, an aim this current buy-out of SABMiller is designed to continue. Their tactics and attitudes have been among the most aggressive and unethical in any American business segment (as masterfully laid out by Edward McClelland in this post from Slate.com, and in this brilliant timeline from Mallory Russell in BusinessInsider.com) and rivaled only, in terms of consumable goods, by Gallo, which tried, back in simpler times, to do the same thing in wine. The difference is that Gallo finally wised up and tried to make better wine as their means of dealing with inevitable changes in American tastes, while AB marches grimly on toward eventual decline, firmly convinced that they’re still the smartest kids in the class and that our enthusiasm for and romance with craft beer is all just a phase we’re all going through – one that leads eventually and inevitably back to everybody drinking Bud and liking it. And that’s why I’m not going ballistic here. The simple fact is, as I’ve written before, AB and Miller and Pabst (with its spankin’ new Russian ownership) and Coors and all those subsidiary labels maintained to give the illusion of choices, are already doomed. The mechanism is simple, elegant, and profound…and unstoppable. Budweiser’s 100-year hegemony in American beer was sustained and enhanced by the idea that our choices were limited to More of The Same. 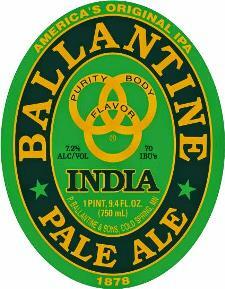 It’s stunning to think of it now but, minus a few noble experiments like Ballantine’s fling with ales that included an IPA that they started making in the 1950s(! ), all American beer was basically the same adjunct Pilsners that Budweiser has always been. I had a young woman, still in her early twenties, ask me recently, what I did when I was her age and wanted an IPA or a Stout. She was totally flummoxed (and, I suspect, doubting my geezer memory) and simply couldn’t understand when I said I had to drink Imports for those styles and that there was not much of a selection, at that. For over 100 years, ALL of us drank variations on Budweiser. We had no choices. Then, starting in roughly the late seventies in the West and late eighties in the East and Midwest, that not-so-subtle programming that drove Budweiser’s dominance – kids opening refrigerator doors from the time they could walk and seeing nothing but BudMillerCoorsPabst – began to be undone by names like Rogue and Deschutes and Great Lakes and Dogfish and some Sam Adams non-Boston Lager selections and Shiner and Anchor (the only craft beer I could get in North Carolina, as recently as 1992!) and American children did not presumptively see only that rack or six-pack of Same Old Same Old. What AB and Coors and Pabst the rest (now that Miller has been snatched up by the Brazilian Overlords) refuse to recognize is that kids who see craft beers in their parents fridges are never coming back to “real beer”, because their folks ARE drinking the Real Beer; the American-made, carefully crafted, locally-owned, choices-galore stuff from people whose interest in the craft do not stop at what appears on their conglomerate’s bottom line. 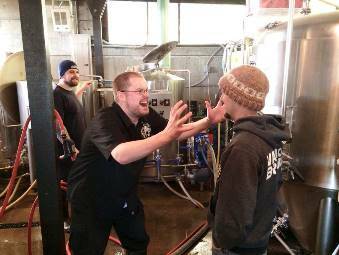 These brewers don’t have conglomerates with deep pockets. They have supporters and determination. They like what they make. They drink it, as opposed to Adolphus Busch, Bud’s founder, who refused to drink his own company’s product, referring to it as “dot schlop” (“that slop”. Adolphus was German.). And the reputations and labels and styles of beers and welcoming attitude of their local craft breweries reflect who they are as young Americans. Our beers are Us, and that’s something that AB is in the process of desperately trying to emulate by their usual methods: throwing money at craft beer. 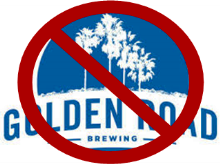 The acquisitions of Elysian and Blue Point and 10 Barrel and Goose Island and, recently, Los Angeles’ tepid Golden Road Brewing represent AB’s only card to play in their attempt to regain control of what you drink: throwing money at problems. AB’s recent history is littered with the wreckage of faux-craft brands they started – usually with no mention of their connection to the parent company – that failed because young beer drinkers of the new millennium are not nearly as stupid and easily-led as AB’s core audience. The internet helped drinkers suss out the corporate ownership and the bland beer in the bottles sparked no one’s imagination. Beer lovers said NO to Bud in record numbers and the brain trust in Brazil, who routinely confuse their back balances with their IQs, continue to insist that we can all be led back, sheep-like, to their corporate trough. And those breweries which sell out to AB do, certainly, gain some audience from the broader distribution that AB owns but have ALL lost major measures of credibility with craft beer fans. The mention you just read of “Elysian and Blue Point and 10 Barrel and Goose Island and, recently, Los Angeles’ tepid Golden Road Brewing” is the last time you’ll see any of those names mentioned here in The Pour Fool, barring another post like this one, in which their servitude to their corporate masters is laid out. And I am light years away from being the only American beer lover to take that attitude. 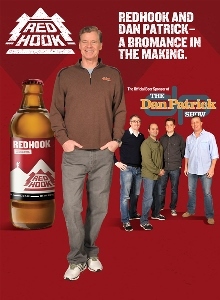 The best example of the failure of AB’s craft acquisition strategy and its inherent flaws is our local Seattle stalwart, Red Hook Brewing, which merely affiliated with AB for distribution purposes, starting in 1994, and then accellerated by the formation of the questionably named “Craft Brewing Alliance”, almost a decade ago. Red Hook, formerly a Northwest Icon, saw their reputation destroyed by the taint of AB’s influence. Their beer, which was never great to begin with, took a quantum nosedive in quality. Red Hook’s management had gambled heavy on the hook-up with Bud and took a lot of advice from the bean-counters on how to be profitable. Meanwhile, down the road in Portland, Widmer Brothers Brewing took on the same affiliation but held AB’s “experts” at a polite arm’s-length. Result: Here in the Northwest, NOBODY includes Red Hook in any list of Washington’s best breweries (Hell, they don’t even make lists of the best breweries in King County), while Widmer continues to make smart, adventurous beers and make money doing it. I want you to make no mistake about this: I’m not going ballistic, here, because I don’t have to. My recent week in Mexico wore me out but, beyond that, BudMillerCoorsPabst, et al, are simply Dead Man Walkin’. America’s drinking habits have changed, across the board, not just in beer. We’ve all discovered that we can keep our precious dollars in our local and national economy and drink beverages that stand up to anything available from anywhere on the planet. In wine, we went through a fifty+ year romance with All Things French, a time in which elegance was equated with a label bearing the magic words “Bordeaux” and “Burgundy” and “Champagne” and wineries went to great lengths to assume the aura of French estates, right down to white labels bearing ink sketches of their buildings and faux-French lingo everywhere. (Chateau Ste. Michelle? Chateau Montelena? Beaulieu? Domaine Carneros?) In whiskey, our only American product was Bourbon, which bears a name we lifted from the French. Today, we drink more domestic wines than we do French and we are right in the birth pangs of an artisan distillery boom in which the term “American Whiskey” is a potent selling point and which rivals the growth of both craft beer and regional American wine. This final point is the one I want everyone to remember: it is very possible, even likely, that we current American beer lovers – those who honor the ideals of “Drink Local”, independent ownership, small business growth, individual achievement, choices, and better beer – can and should(!) be the generation of drinkers who drive AB/InBev into its eventual niche as a quaint remnant of the infancy of American brewing and a small curiosity section at the end of your supermarket beer aisle. Beers like Bud, Bud Light, Miller, Coors, Pabst, etc., will never disappear entirely because there will always be people who prefer them and that’s as it should be. But the relative quality and economic consequences of those beers do not merit their being perennial Top Dog in the American beer marketplace. I’m asking, flat out, that people who truly love and care about craft brewing NOT, ever again, create a stylistic exception which says that a cold Bud Light on a hot afternoon or on your beach weekend in Cabo is allowable. I’m requesting, plainly, that you not reward those brands which sell out to AB with your dollars and your implied approval of their puppet status. I’m asking that you actively seek out locally or domestically-made substitutes for those “summer beers”, those insipid Pilsners that are the mega-brewers’ only working offering, from the rosters of your local brewers…and they’re out there. The majority of American brewers, these days, offer at least a couple of hot-weather beers and many of those actually are Pilsners, but Pilsners done right, with flavor and body and hops and craftsmanship showing with every sip. I’m asking you to simply remove all the corporate beers, the mass-produced, cynical, watery pablum beers from foreign conglomerates, from your worldview. Ignore the entire end of your grocery store cooler that’s devoted to the idea that we’re all the same and that we value repetition and sameness over Choices and variety. We can be the generation of beer drinkers which kicks conglom brewing to the curb permanently. We have pretty much the same problem over here in the UK. All the we’ll known brands began merging in the 70’s until they became no more and breweries began closing so we’re left with vast beer factories where they churn out world beers that taste nothing like the home products. What has happened is a it has created a whole new generation of start ups brewing real ales for the discerning drinker. As fast as the global giants can buy up these growing breweries a new batch of small breweries spring up like a Pheonix from the ashes. As you quite correctly point out, for all their vast buying powers they cannot see that real craft beers are what the customer wants. These “brewing ” giants have changed the face of drinking in the UK, gone are the friendly pubs where you were known by the landlord and all the regulars, to be replaced by corporate marketing tools that are as unwelcoming as the beers they sell. ABInbev’s biggest market is in canned beers sold cheaply in supermarkets, while traditional pubs continue to close week by week! At least the new start ups have given the discerning drinker a regular batches of new beers to enjoy, and beer festivals sponsored by the Campaign for Real Ale (CamRA) are flourishing. Of all the multitude of sins visited upon the rest of the planet by our American culture – which is not at all to discount the tremendous good we’re also responsible for – the influence of Anheuser Busch, and later Miller and Coors, upon the native brewing cultures of England, Scotland, France, Germany, the Balkan states, Russia, and even Belgium is by far the most reductive and debasing. As I’ve said repeatedly about my country, the one resource we’ll never run short on is stupidity and only the very naive would try to propose that the same is not true for every other nation on Earth. The simple core reason for the wild success of our American crap beer model is that MOST humans are not at all discriminating, don’t want to think critically or even comparatively, and really don’t see the difference between carefully and expertly made German lagers and the watery adjunct Pils as cranked out by BudMillerCoorsPabst. Even I, certainly among AB/InBev’s noisiest detractors, don’t really lay all the blame for the success of mega-brewing on the mega-brewers. They created a product and tried to sell it. Granted, AB used every unscrupulous trick in the book to eradicate all competition – hell, they wrote all new books of their own – but each individual drinker has a Choice of whether they like that watery swill or not, and that programming I mentioned in the post – kids opening fridges and finding nothing but one of those crap brands for literal GENERATIONS! – created the habitual, knee-jerk brand loyalty that allowed AC and its imitators to flourish. Yeah, the brewing “giants” changed the face of brewing in the UK…but they had accomplices: people for whom “convenience” and beer that’s consumed with no thought and never changes so much as a molecule is all that matters. The UK, like the US, has its own cross to bear for allowing its fantastic, deep, rich brewing culture to be steamrolled by cynical shysters like AB and Miller. We – and you – should have seen the pervasive blight of Mega-brewers coming and made noise before it became entrenched. Brits should have embraced their own beer and used jingoism for its most positive effect: protecting one’s own traditions. People constantly accuse me of rabble-rousing, of taking all this animus against waaay too seriously. Maybe I do but I know this: you can take cheapening your valued cultural artifacts seriously or you can lose those artifacts. We Americans never really had a grand brewing tradition like yours, so we’re just digging ourselves out from under crap beer now, without benefit of historical perspective. What’s Britain’s excuse? I agree, it’s shameful what’s happened to UK brewing. So…what is THIS generation of beer lovers gonna do about it? The answer, I hope, is to change the paradigm, NOW.